After having tried several markdown editors for iOS I decided that my favourite one is editorial, with a close second being 1writer. Let me firstly note that my experience and needs is for an editor that allows me to quickly and unobtrusively write down on my iPad mini notes and blog posts. Both editorial and 1writer are fairly similar in terms of features. They are both distraction-free editors with user friendly colour themes, including a dark one. Both have most common text settings, like font type, size, etc. Both have sync capabilities with Dropbox. Both can be extended with user scripts, and there is a fair amount of them, particularly in the case of editorial, for your most common needs on their websites1. 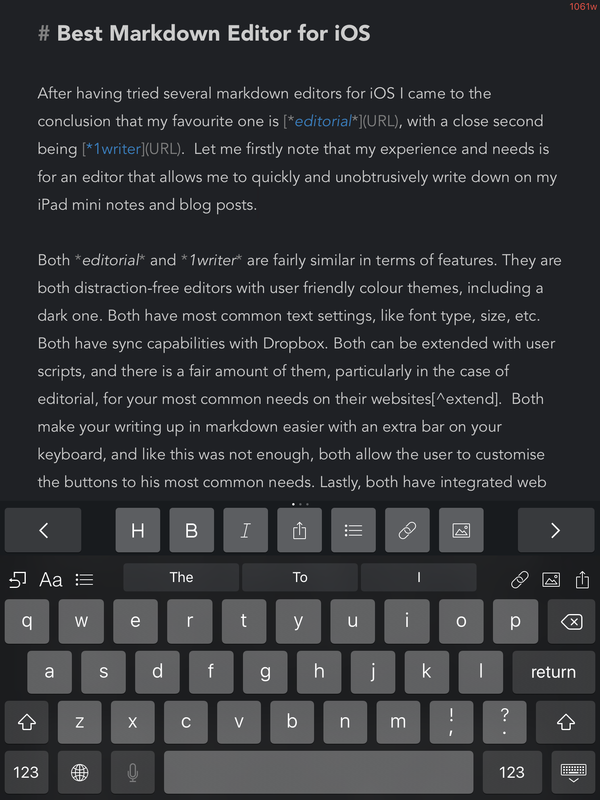 Both make your writing up in markdown easier with an extra bar on your keyboard, and like this was not enough, both allow the user to customise the buttons to his most common needs. Lastly, both have integrated web browsers so you don’t need to jump between apps. So what were the features that gave editorial the edge over 1writer? The most significant ones were the easiness of the preview mode, the compact extra bar on the keyboard that has exactly what needed to write a markdown document, and the ability to fold sections. Let me explain in more detail. Firstly, the preview mode in editorial is a simple swap-left gesture, which can also be done while typing. To go back to edit mode again simply swap-right. It can’t get simpler and faster than that, and it also means that I can do it from anywhere on the screen. In contrast, 1writer has a button, called “preview”, on the top right corner, which is only visible when you are not actually typing, 1writer tries to give the ultimate distraction-free environment by hiding pretty much everything except the keyboard and the word count. In my opinion this is taking it a bit too far. In practice, it means that in order to view the document rendered, I have to firstly press the “hide keyboard” button, then move my hand to the top-right corner and finally click the now visible “preview” button. Considering that I am one of those that likes to preview fairly often the rendered document, especially when I am writing math equations, the editorial way of jumping between edit and preview mode is absolutely perfect and as fast as it can get, in contrast to the 1writer way which is slower. The second main reason I like editorial more than 1writer has to do with the extra bar. In editorial the extra bar contains exactly 15 buttons (14 of them customisable) with the most frequently used markdown symbols all fitted in one single bar. In comparison, 1writer consists of three sliding bars each containing 7 buttons with again the most frequently used markdown symbols and actions (like insert a link or an image) and 2 additional text navigation buttons appearing in every one of them. The bars are navigated by swapping left or right. For me this is an additional slow down when typing in 1writer, and although it could be claimed that 1writer’s bars are more complete, that is partially true since editorial has an additional bar on top that can be customised with these missing actions if needed. Another key feature of editorial is the ability to fold and unfold sections, something that I find particularly useful when editing large documents. I was unable to find this feature in 1writer. Some smaller things that I like in editorial is that I can view the browser the same way that I see the preview (in fact the preview is a tab of the browser), can change the preview theme while previewing the rendered version so that I can quickly see what it looks like in different styles, has smaller side margins in edit mode (I feel that 1writer has fairly wide ones; unfortunately neither of them seems to have an option to adjust them), can see an outline of the document headers and jump to them by clicking the filename on the top of the window (although 1writer can do a similar thing by installing an addon). However, 1writer does have some things that I liked more. For starters, it comes out of the box with some features, like insert image, that in editorial require the installation of an addon. A key advantage that I found in 1writer over editorial was that it works pretty much again out of the box well with Mathjax, all needed was to add the script as described in the Mathjax docs in my document and that was it. In editorial math rendering seems to happen initially, but once the text is updated then it is lost. Another advantage that 1writer has is that although the number of addons is smaller than of editorial, they are more organized. In editorial there might be multiple community addons for doing the same thing, without any notion of what are the differences between them or whether they actually work. Lastly, it is worth mentioning that 1writer is at half the price of editorial, but none of them will really break the bank. In my case, the features of editorial are worth the extra few pounds. 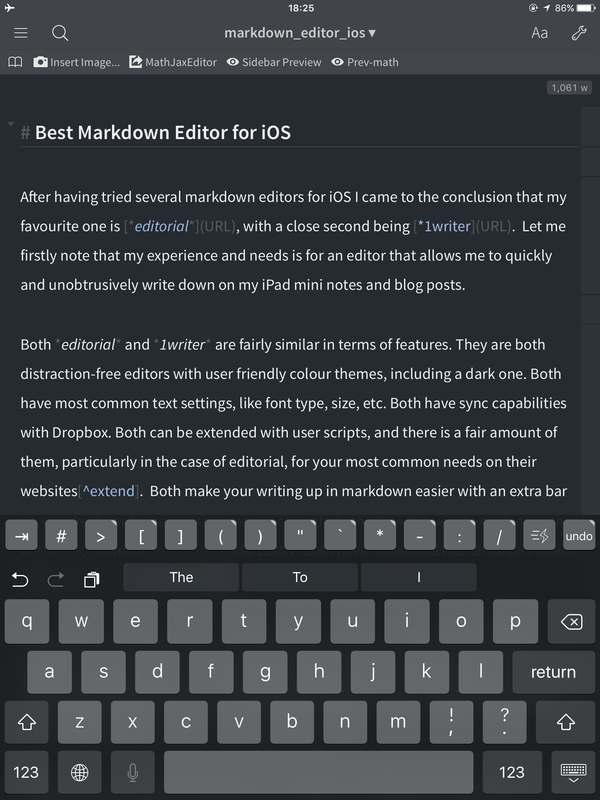 Both editorial and 1writer are excellent markdown editors in iOS. They are both feature rich distraction free editors and come at reasonable prices. Out of the two, editorial has the edge due to a few features that better suit my workflow. I recommend them both and definitely suggest you try them out if you are looking for an iOS markdown editor.